Habit: Annual, perennial herb; often glandular, glands often wart-like, round, pitted. Leaf: sheath margin hairy on sides just below collar; ligules ciliate. Inflorescence: generally panicle-like, open or dense, occasionally spike-like, often glandular. Spikelet: laterally compressed; glumes +- unequal, acute or acuminate, 1(3)-veined; florets 3--many, axis breaking above glumes and between florets, or persistent, with glumes, lemmas deciduous, paleae remaining attached or not; lemma keeled or rounded, acute or obtuse, 3-veined, veins generally obvious; palea +- = lemma. Fruit: 0.4--2.4 mm, variously-shaped, occasionally longitudinally grooved, generally not noticeably compressed, generally red-brown. Eragrostis cilianensis (All.) Vignolo-Lutati ex Janch. Habit: Annual. Stem: spreading or decumbent, occasionally abruptly bent, often branching, < 6 dm; glands generally present below nodes. Leaf: sheath glabrous, long-hairy below collar, keel glandular; blade 10--20 cm, 2--8 mm wide, flat or inrolled, margin with wart-like glands. Inflorescence: < 20 cm, 5--6+ cm wide, +- compact, generally gray-green; spikelet stalk generally not glandular. 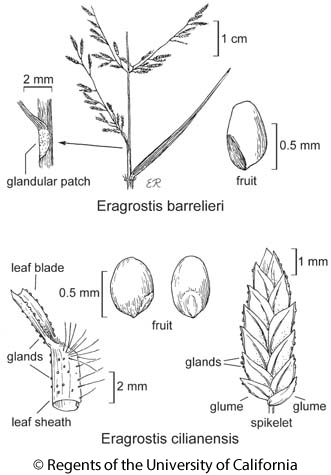 Spikelet: 2.5--3 mm wide, linear to ovate; glumes 1.5--2 mm, +- equal, midvein often glandular; axis not breaking apart; florets (5)10--45; lemma 2--2.5 mm, lateral veins prominent, midvein generally glandular; palea persistent; anthers +- 0.2 mm. Fruit: +- 0.6 mm, +- spheric, not grooved. Chromosomes: 2n=20. Citation for this treatment: John R. Reeder 2012, Eragrostis cilianensis, in Jepson Flora Project (eds.) Jepson eFlora, http://ucjeps.berkeley.edu/eflora/eflora_display.php?tid=24456, accessed on April 19, 2019.